Tijuana (Agenzia Fides) – Still on the danger list but slowly improving: Rev. Juan Antonio Zambrano García, of the archdiocese of Tijuana, was attacked and wounded last Friday, June 9, in the parish of San Pedro e San Pablo where he is parish priest. Fr Zambiano being stabbed twice, first with a knife and then with a screwdriver. The Archbishop of Tijuana, Francisco Moreno Barron, in a report to Fides, expressed concern for the growing number of similar attacks. 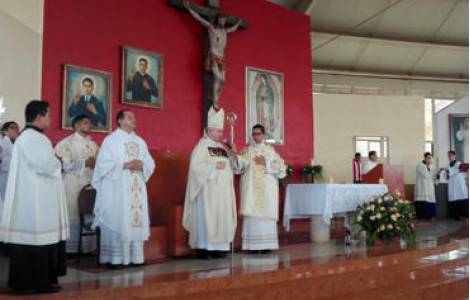 On 15 May another diocesan priest, don José Miguel Machorro, was stabbed at the altar as he finished saying Mass in the Metropolitan Cathedral of Mexico (see Fides 16/05/2017), suffering serious wounds which at first appeared fatal. Fr Omar Sotelo, Paolino, Director of a local Catholic Multimedia Centre, which every year carries a report on violence and homicide involving priests and religious men and women in Mexico , sees this most recent attack in Tijuana the latest in a series of criminal actions in recent years against the local Catholic Church. "Violence against the clergy has increased in recent years, but nothing concrete has been done to stop it. Our people, we know, are permanently exposed to crime, but especially now the priesthood is becoming a dangerous ministry. For the last seven years, Mexico has registered the highest number of priests murdered" said Fr. Sotelo. In the last five years in Mexico 17 priests have been assassinated, 2 are still missing and 2 suffered attempted abduction. The Archbishop of Guadalajara, Cardinal Francisco Robles Ortega, during Mass celebrated last Sunday, 11 June, at the Church Shrine de los Martires, denounced, in a growing situation of violence, an attempted robbery against a priest: threatened with pistol and then with a knife by two men, he was robbed of his car. “Fortunately the priest remained calm– the Cardinal said -, while the two men incited one another to violence. This shows what our citizens are exposed to in a car park in broad daylight…we do not see the protection which the authorities have the duty to guarantee ".